Once very popular in Asia from the 18th to the mid-20th century, the reverse glass painting (RGP) art form was inspired by the European tradition of painting directly on flat glass to be seen through the reverse unpainted side. RGPs were known at the court in Burma since the 18th century. They became popular between the mid-19th and the mid-20th century for Buddhist merit-making and worship of the divine due to their glossy quality. With the advent of print, the tradition vanished. RGPs were again revived by devotees of nats spirits and wizard followers in the 1970s until the turn of 21st century. RGPs donated to the Burma Art Collection at NIU over the last 30 years prompted the study of the vanishing art form. 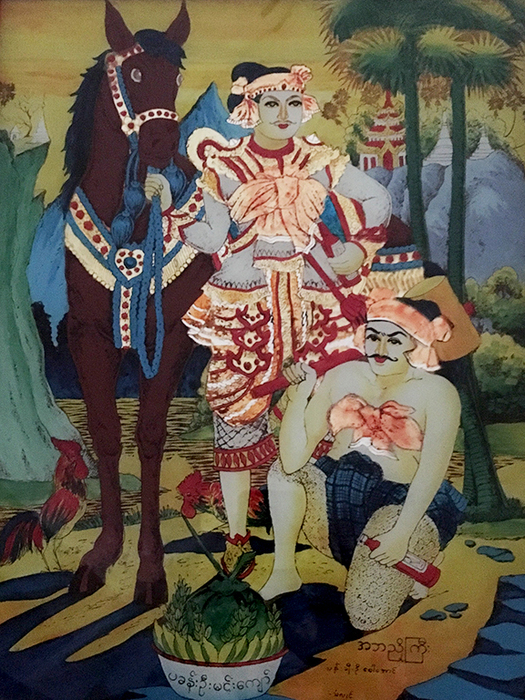 Since 2014, the Reverse Glass Painting Project was launched by the curator of the collection along with a team of students and faculty from NIU and two Burmese universities. Together, they have explored the RGP techniques and interviewed the remaining Burmese reverse glass painters. This exhibition is the result of this interdisciplinary research and collaboration.